Slovenia will very soon become a part of the Schengen territory. What does this mean for you and for Nova gorica, which is located along the border? This event is for the people at the border even more important moment as the Slovenian access to EU or the acquisition of Euro. Now there will be no more border in physical sense what means our common area of Gorica will really be united. People will be able to cross the border everywhere. Important is also the feeling that it is not necessary to stop at the border anymore and to show documents. Nova gorica is already now developing very successfully and I am convinced the new reality will have positive effects to future development. How are you preparing for this event? For such an important historical day we have prepared a rich programme of performances, which will take place on December the 20th. The main manifestation on the occasion of Slovenian entry to the Schengen territory will be at 9.00 p.m. in the new sportshall in Nova gorica - amusing ceremony on the border theme “La prepustnica” (directed by Boris Kobal). 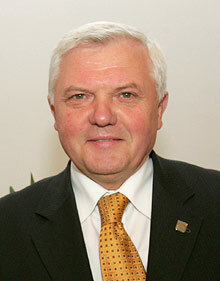 The honorary guest will be the newly elected president of the Republic of Slovenia dr. Danilo Türk. Next there will be the turning on of lights on the common market of both towns- the European market, with a concert of Christmas and New year songs and with mulled wine, warm tea and trials of holiday delicacies. At midnight there will be- at the international border crossing Rožna dolina-celebration by the last lifting of the border gates. Finally the mayors will symbolically take a drive across the “once local border crossing” in the center of towns Nova gorica and Gorizia. In Rožna dolina-near the international border crossing- an amusment for young people will go on, starting at 8.00 p.m., with different musical groups. We are very glad that the mayor of Klagenfurt, mr. Harald Scheucher, will be our guest in this very important event. What do you expect from your membership in AACC and from the signature of the document of mutual cooperation? Because of our geographical position we are more closely connected with the neighbourhood Italian communities , however we endeavour to strengthen our cooperation with Austria and here we see the role of the Alps-Adriatic Centre for Cross-border Co-operation as the most convenient link between the Slovenian and Austrian territory; AACC unites namely experiences of the Slovenian reality and the Austrian daily life, too.